Already announced was the late Glenn Frey's 24-year-old son, Deacon who Don Henley brought in to the band, comparing his inclusion to the old guild system where sons learned their father's trade to take it over later. Today (June 1), it was announced that Vince Gill would also be included with the band at the shows, sharing the Glenn Frey sung songs with Deacon. Gill, who is best known for his country music and is a member of the Country Music Hall of Fame, also has a long history in rock and country rock. In 1979, he became a member of Pure Prairie League and sang lead on their 1980 top ten hit Let Me Love You Tonight. He left the band in 1981 to join Rodney Crowell's group and, by the middle of the decade, had gone solo with his debut album The Things That Matter (1985). Overall, he has had 25 top ten solo Country Singles including number 1's I Still Believe in You, Don't Let Our Love Start Slippin' Away, One More Last Chance and Tryin' to Get Over You. Gill is considered one of the best guitarists out of Nashville and has been part of Eric Clapton's Crossroads Festivals over the years. In response to the announcement, Gill said "In my mind, I always thought I’d have made a good Eagle but in a million years, I never would have seen this coming. It’s pretty surreal. I turned 60 recently, and to get to be a part of this amazing legacy of songs, that’s the greatest part of all this for me." In a conversation with the Los Angeles Times, Henley said he didn't know what the future would bring. "We’re just going to see how it goes. We have every reason to believe it’ll go just fine. Then it’s Irving’s [manager Irving Azoff] ball. "People want to hear these songs played live, by the band that recorded them ... and even though it’s not exactly the same band, they want to hear the songs. I think we’re doing it in a highly ethical manner that I think Glenn would approve of. " 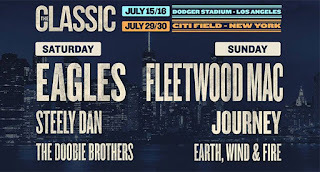 The Classic West Festival will be July 15 and 16 at Dodger Stadium in Los Angeles while the Classic East will be July 29 and 30 at Citi Field in New York. 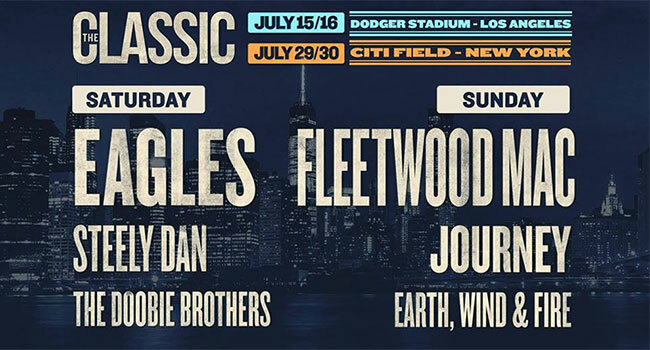 The Eagles, Steely Dan and the Doobie Brothers play each Saturday and Fleetwood Mac, Journey and Earth, Wind & Fire perform on Sunday.